Cultivate a love of literature with this text that leads readers beyond the boundaries of self, to see the world through the eyes of others. 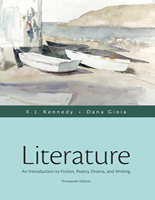 Built on the assumption that great literature can enrich and enlarge the lives it touches, this text was developed with two primary goals: to introduce students to the appreciation and experience of literature in its major forms and to develop students’ abilities to think critically and communicate effectively about and through writing. The AP edition includes a robust selection of customized resources including access to MyLiteratureLab with an enhanced eText, The Literature Collection: An eText.